Sarah Lue Milon, 71, died Wednesday, March 7th, 2018 at WRMC with her family by her side. Sarah was born August 6th, 1946 in Batesville, Arkansas to Herbert and Mattie Mae Williams Milon. She was the youngest girl of 10 kids. She accepted Christ into her life at a young age. She was a devoted member of New Testament Holiness Church for more than 20 years where she was on the usher board. 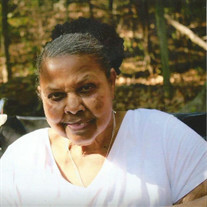 She attended Miller High School which she graduated from in 1966. She was a devoted mother of a daughter who was her life. She worked at the shoe factory in Batesville and Woodlawn Nursing Home until she became disabled. She was preceded in death by her parents, Herbert and Mattie Mae Williams Milon; five brothers and two sisters: Maurice Milon, Frank Milon, Carl Milon, Charlie Milon, Allen Milon, and Birdie Bone and Nola Lewis and other relatives. She is survived by her daughter, Latoya Cox, son-in-law, Rick Cox, of Batesville, Arkansas, two brothers, Merbert (Stella) Milon of Sebastian, Florida, and David Milon of Batesville, Arkansas; sister-in-law Patricia Milon; and a special nephew, Kellen Huffman of Batesville, Arkansas. Funeral services will be held at New Testament Holiness Church on Saturday, March 17th, 2018 at 1 PM. Visitation will be at Willis Funeral Service on Friday, March 16th, 2018 from 5-7 PM.